THE HERITAGE DEPARTMENT has said that it has not been contacted in relation to an apparent archaeological “find” at the ancient historical site of Loughcrew. A spokesperson also said that while a video purporting to show a discovery was “certainly intriguing and very entertaining”, archaeologists had no intention of investigating it. A video was posted on Facebook yesterday by a user which showed three men with a shovel and wearing gloves digging through muck and stones. As the men dig, a shape begins to be uncovered in the ground. Eventually a full human-like shape is uncovered. The men state that they believe it is stone. 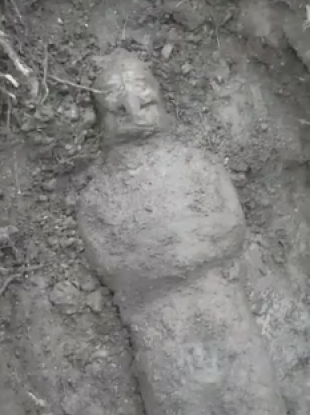 The supposed statue has what appears to be mask with a beak on the end of it. The “discovery” has gained some traction on social media since the video was first posted yesterday evening. Both the Meath Chronicle and Independent.ie reported on it, and it has been shared on Twitter and Facebook. In the video description, one of the men says that the group were working near to the ruins of St Oliver Plunkett’s Church at the Loughcrew site, near Oldcastle in Co Meath. Loughcrew itself is an ancient site of considerable historical importance in Ireland, and contains megalithic burial grounds dating back about 5,500 years. It is one of the four main passage tomb sites in Ireland. In the video post, one of the men said they were building a stop on a new fairy trail in the area when they “came across a rock we couldn’t move and as we cleared away we ended up with this”. The Facebook description states that people from the “Department of Environment” were in the process of “excavating” the site. “They’ve a big tent over it and lights, they went clean mad at us when they arrived and said we should have left it alone,” the post reads. Responsibility for finds such as this would rest with the National Monuments Service, which is a part of the Department of Culture, Heritage and the Gaeltacht (and not the Department of the Environment). Meanwhile, archaeologist Neil Jackman told TheJournal.ie that he had “never seen anything from any period of Irish archaeology that looks anything like it”. Email “Heritage Department has ‘no intention’ of investigating mysterious Loughcrew ‘find’”. Feedback on “Heritage Department has ‘no intention’ of investigating mysterious Loughcrew ‘find’”.